There are lots of projects we hope to complete over the next 3 months. I say “we” but I really mean Steve. He’s the handiest man I know. I help occasionally when he needs an extra set of hands but I can’t take credit for any of the finished projects. Steve started the head renovation on Monday. He finished it today. There are a few finishing touches to add, but to quote my girls, it’s SO fancy! Enjoy the show!! A shout out to the father of my granddaughter, I mean my son, for the “techy” tutorials. Having an Instructional Technology Facilitator in the family is coming in quite handy! Bear with us as I learn and he teaches. This morning, I turn on the water in the bathroom (AKA head) to brush my teeth and no water comes out of the faucet. We started working on replacing the bathroom fixtures yesterday so I assume Steve turned off the water or something. No big deal. Brushing your teeth in the kitchen (AKA galley) sink for a couple of days is a small price to pay for new bathroom fixtures. Hmmm…no water in the kitchen either. That doesn’t make sense. We have two water tanks. I know one’s empty because we just switched over to the second one yesterday but there’s NO way the second tank can be empty. I also know I use a lot of water but I haven’t used THAT much. Side note…I don’t have to worry about how much water I use right now because we’re at the dock. We have an unlimited supply. Steve’s still sleeping. I am not going to wake him up to tell him we don’t have any water. One, that’s not a nice thing to wake up to and two, I don’t want to hear AGAIN how much water I use. So, I fix a cup of coffee and start reading email and do some online banking. Steve gets up and heads into the bathroom. “Wow. We’re out of water.” WHEW! He’s surprised. I knew I hadn’t used that much water. I figure we’ll fill the tanks after we drink our coffee but no, Steve says he’ll drink his coffee while he fills the tanks. He’s thinking we have a leak and wants to get to the bottom of it. I pull the cushions off the settee to see if there’s water where there isn’t supposed to be water. (I should have taken a picture to show you where this tank is located, but I am still in a pre-coffee state.) Nope, all dry and the tank is definitely empty. I hear the water trickling into the tank and sit down to watch it fill up. Steve doesn’t like to overfill the tanks so I let him know when they are full. Next thing I know, he’s pulling the hose out of that tank and starts filling the other tank. I stick my head out the companionway. “That first tank is nowhere near full.” Steve has a pretty good idea what the problem is. The vent line is clogged. He unhooks the vent line from the water tank and blows into it. Yep. It’s clogged. He grabs a little screwdriver, heads back outside and then yells at me to blow into the vent line. All right. I’ll give it a whirl. M: How can I tell? Here comes Steve. He blows into the vent line. Yes, it’s still clogged. (I still don’t know how he can tell.) I can see him thinking. M: Will canned air work? S: No, not enough pressure. M: How about picture hanging wire? I have some in my tool box. S: Not rigid enough. I need something thin and rigid. I decide to go take a shower while he ponders on what he can use as a snake to unclog the line. He thinks it’s a dirt dobber’s nest. On my way out to the shower, I ask if a zip tie will work. I can see him thinking. Steve is sitting on the settee drinking his second cup of coffee when I return from my shower. Vent line is unclogged. Ahhh, the zen of zip ties. I know. No pictures today. I will do better, I promise. Actually, I AM doing better. I have been taking lots of pictures of our bathroom project, and if all goes well, we’ll be posting those in the next day or two. Our full enclosure will look similar to this one. I like to think of it as my sunroom. As requested by my son and cousin, today’s post includes virtual tours of FNR, both outside and in. Knowing that videography is not a strength for either one of us, Steve and I decided to split up the videoing with him doing the OUT and me doing the IN. We watched the videos together and were reminded once again how different our approaches are to this adventure and to this blog. Obviously, Steve knows boats and I do not. He’s a sailor and I am not. He’s going to make sure FNR is seaworthy and chart all of our travels. I am going to make sure Steve is seaworthy and that we are comfortable when traveling. He’s the Captain and I’m the First Mate. As far as the blog goes, there will be posts talking about how Steve replaced our headliner, about cracked Electro Scans, about pink algae in water tanks, about replacing leaky ports, about the trials, tribulations, and thrills of living on a boat…things that other Cruisers and Liveaboards may be more interested in. For family and friends, there will be posts about the places we see, the people we meet, and about how much we miss you and wish you were here. For now, we are staying at the marina until the end of June – that’s when our lease runs out – so you’re going to have to wait a bit for the places we see and the people we meet blogs. We still have boat projects to complete – new countertops, sinks and faucets, a full enclosure, mounting a TV, replacing salon cushions, learning how to take videos, etc. – so we’ll have plenty to blog about. When we do set sail, we plan to spend a few months in the upper Chesapeake and then head down to the Florida Keys for the winter. That’s all we have planned for now and even that is subject to change. After 75 plus combined years of employment, there will be no schedules, just routines subject to change. No deadlines, just ETA’s. No rat race, just zen on a boat. Author Marci FisherPosted on March 30, 2015 September 4, 2015 Tags blogging1014 Comments on Welcome Aboard! Memorable experiences. We all have them and, if asked, can quickly rattle off a few. I imagine mine aren’t much different or more memorable than yours. I’m sure you can relate. My first kiss…8th grade on the school track after track practice. Myrtle Beach after high school graduation. The birth of my son. The birth of my daughter. The birth of my second daughter. The birth of my granddaughter. 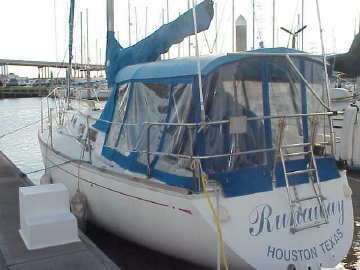 Selling our home and nearly everything we own, retiring and moving onto a sailboat. Okay, I know a lot of you may not be able to relate to the last one, but that’s what this blog is going to be about. We’ve lived on FNR, a 1986 Cal 33 for 2 days now, downsizing from a 1900 square foot house to a walk-in closet. Steve and I hope you’ll enjoy reading about how we got here and where we hope to go. We think it will be a memorable experience. Zen In A Camper Blog at WordPress.com.